Time for the 2018 addition of the 1KC ride Hamilton start. 1000 kms in 12 hours (or so). This years was around the mountains sort of. Around the Coromandel loop anti-clockwise then down around the 3 big mountains in the middle of the island. A week out the weather forecast did not look too hot and the best outcome was rain. A couple of days before however it said showers clearing. Much better. I had planned to leave home around 2am but was up early again so ended up leaving at 1am. The stars were out and while no sign of any rain, it certainly had left the roads quite wet. It was very foggy through Uriti and up over Mount Messenger but soon cleared. 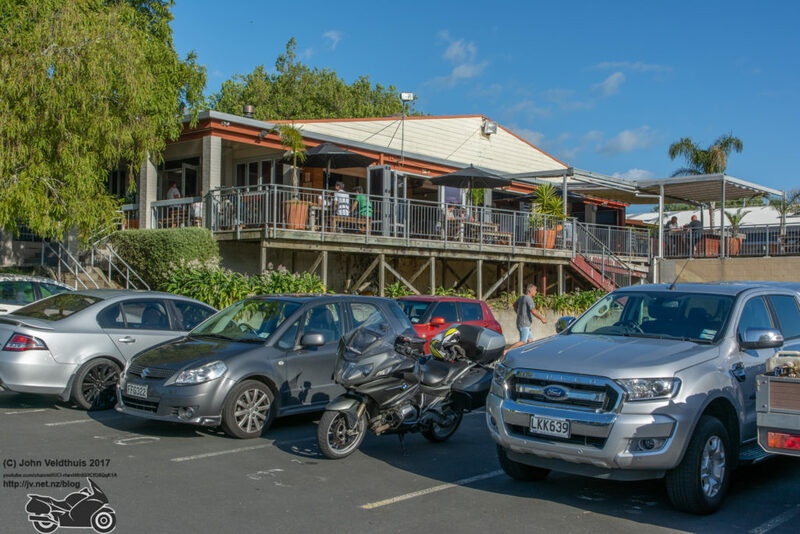 I arrived in Hamilton and filled up the bike and arrived at Eastside Tavern at around 5am. Set up my GoPro Hero 7 camera and the battery system and tried to catch a few winks but not to be. Soon a few others arrived and just on 6am we started the process of acknowledging we had arrived and started. I won a spot prize of hex keys which was much appreciated. I was off at 6:10am being the first away with the weather looking very good. Roads still damp but the sky was clear. 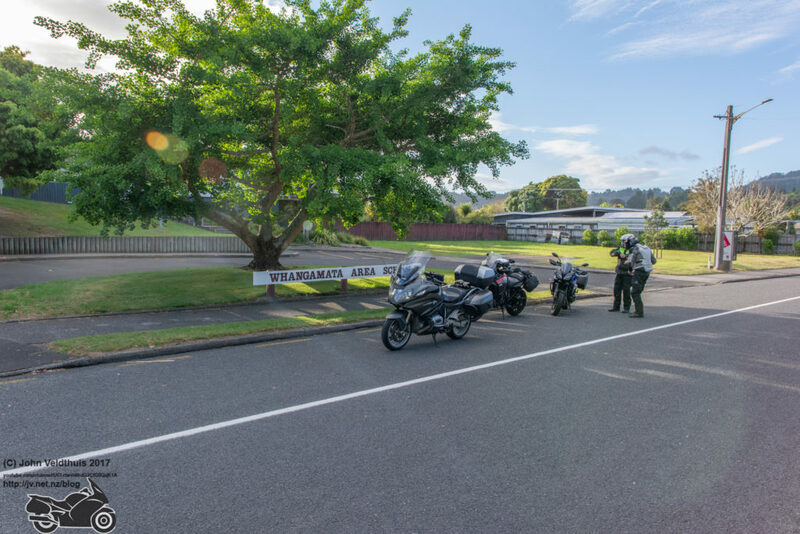 First checkpoint was Whangamata School and to get there went through Morrinsville, Paeroa, and Waihi and then heading up towards Whangamata. Had the sun in my eyes a few times but nothing bad. The ride through the Karangahapi Gorge was awesome and had no traffic going my way so was pure joy. Some more twisties before Whangamata and it was time to take a picture that I had been there. My camera was taking it’s time locating the GPS signals so decided I might as well have a pitstop. Just as I was taking the picture a couple of others pulled up. 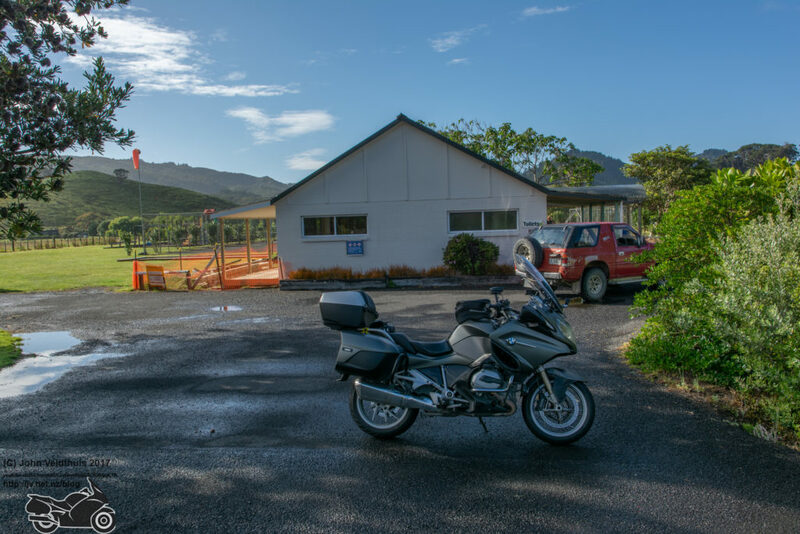 Next stop was 92km away at Kuaotuna and this was a continuing nice ride on some more twisties before pulling up at the toilets there to take a photo of them. The other two pulled up again just as I took my photo. 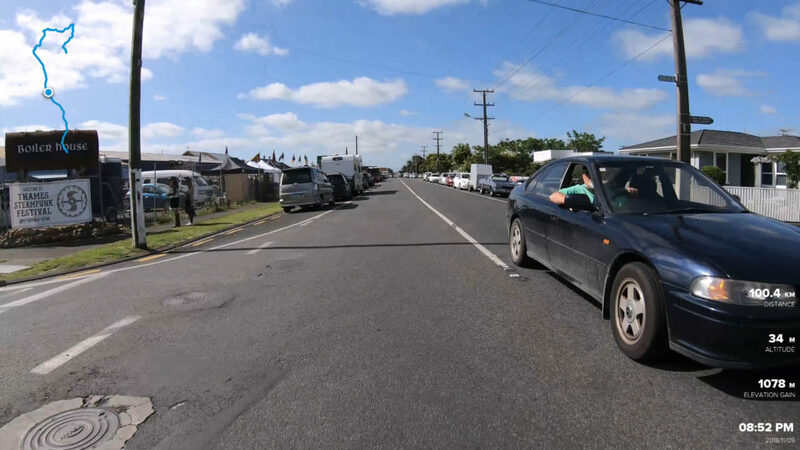 Just as I was getting back on my bike some tool pulled in to block me getting away. He was driving a Nissan 4×4 towing a boat and it was the first I saw of him. I managed to get out and start riding off just as he was getting out. He stopped and hopped back in pulling out and driving again. Never saw him again so not quite sure what he was doing. 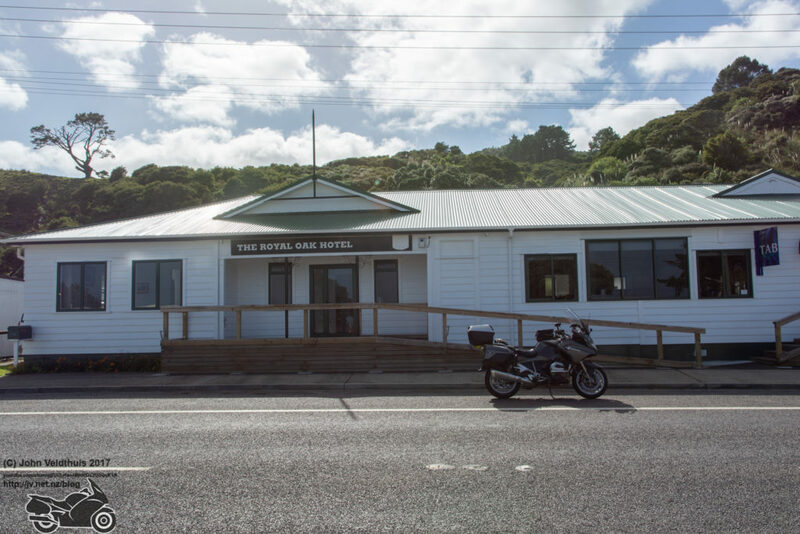 Next was through Coromandel and down the coast to Tapu 62kms away where a photo of the Royal Oak Tavern was required. Quite busy here so needed to be careful not to get run over while taking the photo. I had to force the GPS to recalculate because it was giving me issues and after each stop was not telling me the directions even though it had the right route up. It does this sometimes with trips and this time it did it the whole way. As I passed through Thames everyone was dressed in medieval stuff. The picture shows a young lady trying to get into a corset. Finally came up on Tirohanga School and was looking for a big mural wall. Could not see it and wondered if I had the right place but I had got the coordinates from Google Maps which showed the mural. I took the photo of the school with the sign in the name to make sure. 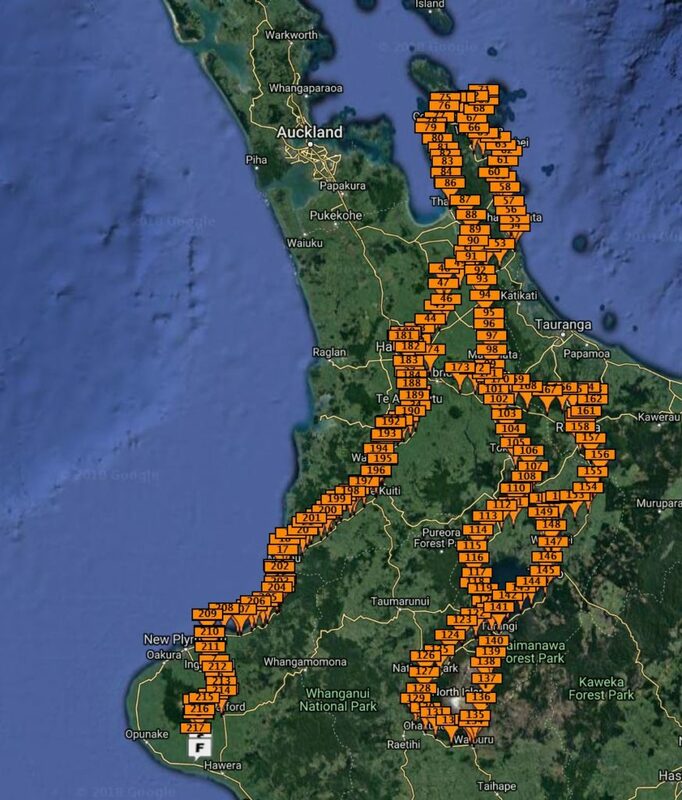 Next stop was only 62km away at Kuratau Junction. A boat shed that did not look at all like the photo when I got there but decided this must be it so took the photo. 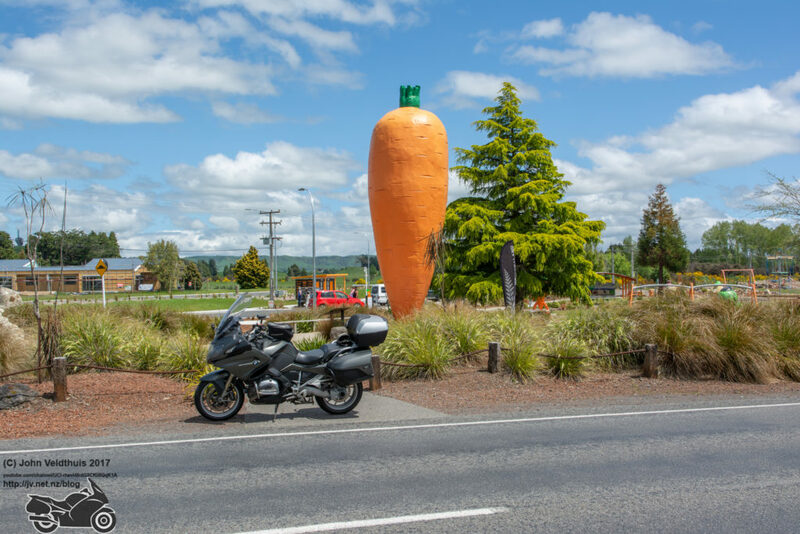 Another 102km to the next checkpoint which was the Ohakune carrot. 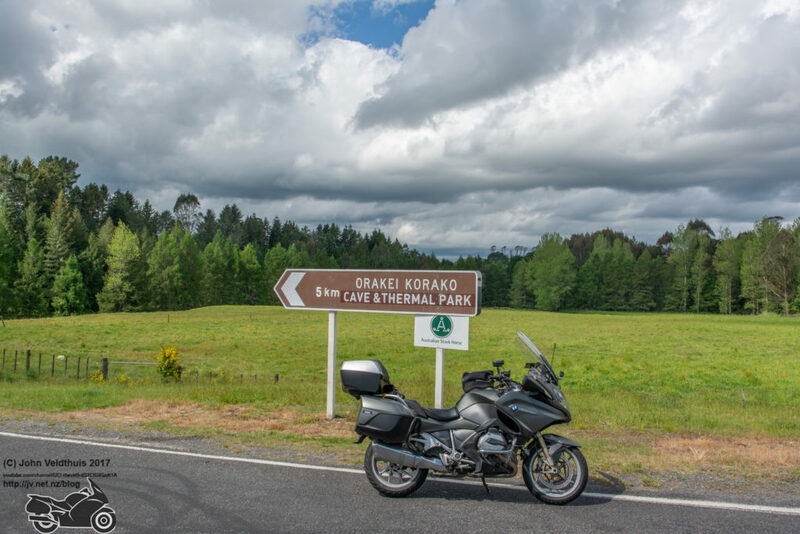 Through Tokaanu and up over Te Ponanga Saddle to National Park and down and to the left to Ohakune. Getting real sick of this road as I have used it many times in recent times. The carrot loomed, and photo was taken. Next from here was 170km away and my bike was starting to complain that it was thirsty and wanted a drink. 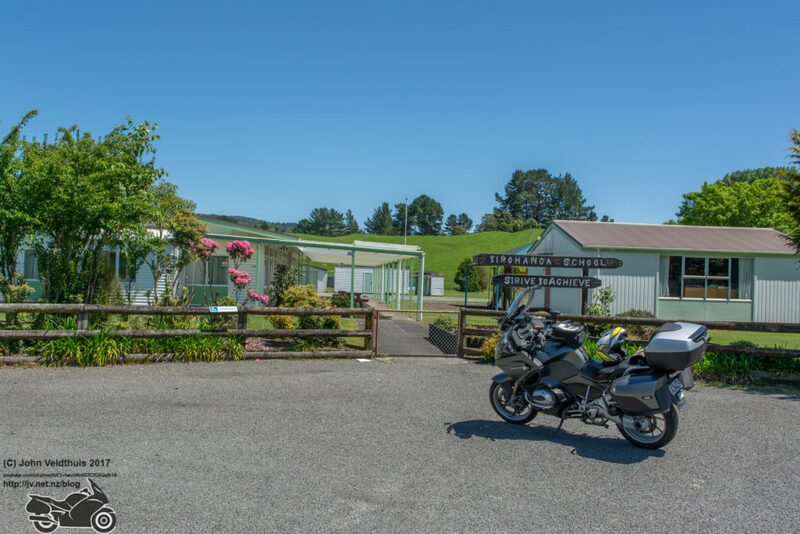 I would not have made it to Taupo and I did not want to stop at the rip off Z station at Turangi so decided to do my final fill at Waiouru. Got here and the stupid pumps would not accept my fuel card so I missed out on my savings. After 6 attempts I used my visa instead. Next a blast up the desert road and it was getting a bit dark overhead. Actually got a few spots of rain but it soon went away and cleared again. North of Wairakei I turned right and headed for Orakeikorako road for the next checkpoint picture of the road sign. Next stop was 77km away at Mourea Mini Mart. Carried on the SH5 and then up to Rotorua. Around the by-pass to the right and I was soon at the stop and taking the photo. 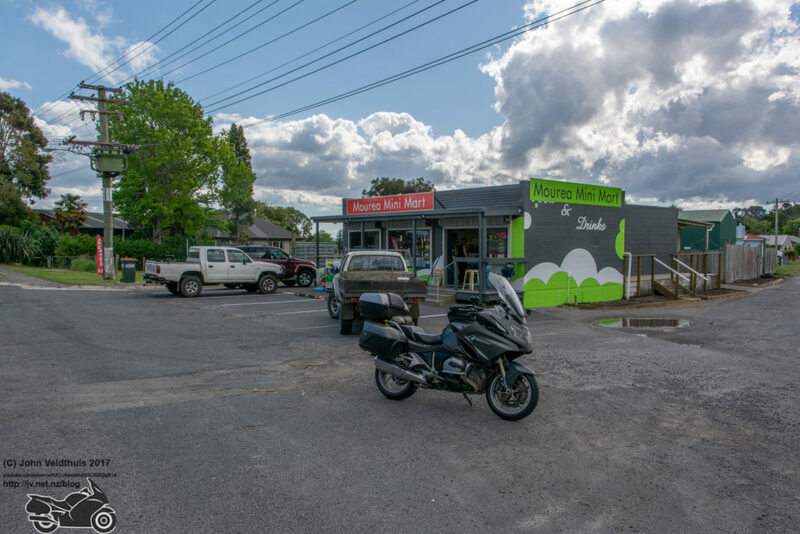 But in Rotorua I saw the cheapest fuel yet so I decided to top up the bike here although it didn’t really need it. Arrived at 4:30pm and took the photo. Now only the straight run back to Hamilton to finish. However while I was mucking around resetting the GPS again I missed the turn off and had to do a U-turn and get back on track. 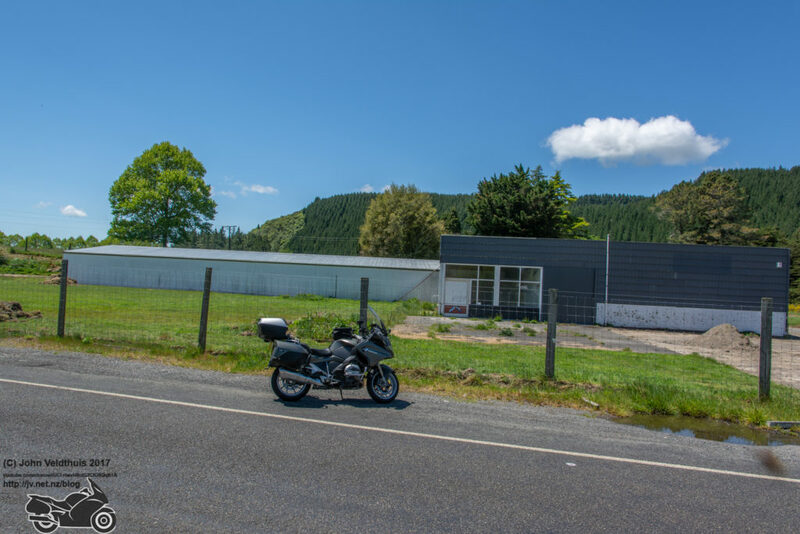 The GPS took me up another road that I was not familiar with but it reconnected to SH5 so I carried on. It was the route I originally planned but it seemed wrong at the time. 111km later I was back arriving at 5:40pm which is what the GPS had been predicting all day. Had a bit of a wait as they said no one would be there until 6pm. Three other arrived shortly after I did. Got my certificate and badge and said my goodbyes as I still had another 3.5 hour ride home. 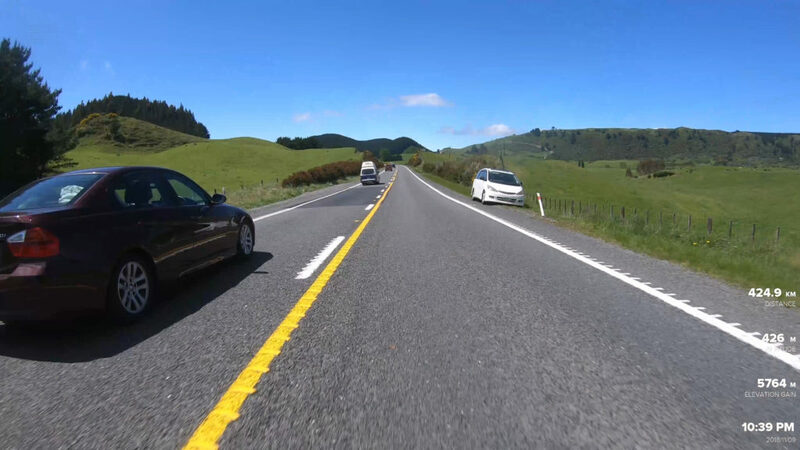 Only issue on the way home was I forgot about the fixed speed camera at Otorohanga and for the life of me I can remember what speed I was doing when I went past it. My GPS usually warns me so maybe I was under the speed limit. Time will tell. A youtube video of the ride is below.